From stubborn adhesive to piles of soggy paper, taking wallpaper off your walls can be a messy endeavor. But while it’s possible to paint over wallpaper, it’s best to strip it and start fresh with a smooth, even surface. To streamline the process, we’ll walk you through the easiest ways to remove wallpaper and the best wallpaper removal tools to get the job done without damaging your walls. Read on to find out how to remove stubborn wallpaper with expert tips from Rust-Oleum and HomeRight. How Hard Is It to Remove Wallpaper? We’ll be honest – wallpaper removal can be very time-consuming and labor-intensive. Depending on the age and style of your wallpaper, the difficulty varies. Typically, the toughest aspect is removing wallpaper glue and backing. While you may want to speed up the process, working too aggressively can damage your walls. So, remember: patience and preparation are key. “Strippable” wallpaper, a modern application, is designed to be easily removed without tearing. Traditional wallpaper requires more effort but can be stripped with the help of scoring, solvents or steam. Vinyl or laminated wallpapers are the most difficult to remove since their washable surface makes it difficult for steam or solvents to penetrate. A wallpaper scoring device can help, but you may want to consult a professional. Pro-Tip: To remove vinyl or laminated wallpaper, peel away the top layer first to reveal the backing. If you come across sections that are difficult to remove, score these pieces with a wallpaper scoring tool and use a wallpaper remover to soak into the vinyl and adhesive. Homes built before the 1950’s generally have walls made of plaster over wood, gypsum or metal lathe. Since wallpaper doesn’t adhere directly to the wood, removal is usually easy. Plaster is also much more resistant to water than drywall, making steaming safer. Homes built after the 1950’s are likely constructed with drywall. If the wall was primed before wallpaper was applied, removal should be easy. But when wallpaper bonds directly to drywall, it can be very difficult to remove without causing damage to the wall. Pro-Tip: To find out which type you have, check under a wall plate or light switch to see an exposed section of the wall. Drywall will be thin and uniform, while plaster will be troweled right up to the electrical box. *These tools may be optional depending on the type of wallpaper. Let’s get the room ready. Move furniture away from the walls or out of the room. Remove everything from the walls including art, electrical plates, phone jacks, etc. Turn off electricity to the room at the fuse box, then mask outlets and switches with painter’s tape to prevent shock or damage. Tape plastic along the baseboard to keep water or solvent from dripping onto the floor. Cover the floors with a drop cloth or plastic. You can also place towels near the walls to absorb water. Keep children and pets away from the space. Old wallpaper glue can contain toxic fungicides. Wear disposable gloves to protect skin. You can also wear a face mask, eye protection and knee pads for added safety. Place garbage bins nearby lined with heavy-duty trash bags to dispose of paper and residue. Pro-Tip: If you’re removing several rooms’ worth of wallpaper or if this task is part of a larger home improvement project, consider renting a roll off dumpster to handle the debris. Now that you and the room are ready, let’s get to work! Start at a corner, loose seam or an outlet and use a putty knife to peel the top layer of wallpaper. Leave the backing on the wall for now – we’ll work on that next. If you can tear the paper off in complete or partial sheets, this is called dry stripping. When working with well-primed walls, you should be able to continue dry stripping and finish the room in a couple hours. The longer the paper has been up, the more difficult this will be. If you have trouble removing the facing, we have you covered with the next steps. Run a scoring tool all over the remaining wallpaper and backing. Whether you decide to go with solvents or steam, perforating the wallpaper with tiny holes allows the layers to be saturated. Pro-Tip: Be careful not to score too hard and damage the wall surface. Both options are good choices for taking down the remaining wallpaper. Read on to learn the specifics of each. Wear rubber gloves and eye protection. Most chemical solvents are caustic – so avoid skin exposure. Dilute the solvent with water. Follow the manufacturer’s directions to prepare for use. Spray or sponge apply your wallpaper stripper. Wait two to five minutes for the solvent to penetrate. Remove wallpaper carefully with a scraper. Be careful not to gouge the wall or your hand. For safe removal, you can use the Zinsser Paper Scraper. Continue this process in sections. Apply solvent only to the space you can strip in a 15-minute period. Using a steamer to remove wallpaper is an eco-friendly alternative for stiff and heavy products. You can rent a commercial steamer at your local home improvement store. “We have found that one of the easiest ways to remove wallpaper is with steam. Stripping wallpaper can be a painful chore, but using steam makes the job much easier,” said Makayla Durand, Marketing Assistant at HomeRight. Open a window or ventilate the room to keep moisture from building up. Add water to the steamer and allow it to heat up. Follow the manufacturer’s instructions. Hold the steamer pad or plate to the wallpaper. Give it enough time to penetrate the paper and soften the glue. Be careful not to hold too long – you can damage the drywall or soften the plaster. Use a scraper to remove the wallpaper and backing. Do not use your hands! The paper and glue will be very hot from the steam. Don’t work too aggressively. The drywall or plaster may be soft. Repeat this process in small sections so the backing doesn’t dry out. Don’t keep the drywall surface wet for longer than 15 minutes. To ensure fresh paint coats your wall evenly, you need to make sure the surface is clean and flat. Sponge the walls with clean water to remove remaining adhesive. Be careful not to oversaturate drywall. Allow the walls to dry for a few days before painting or recovering. 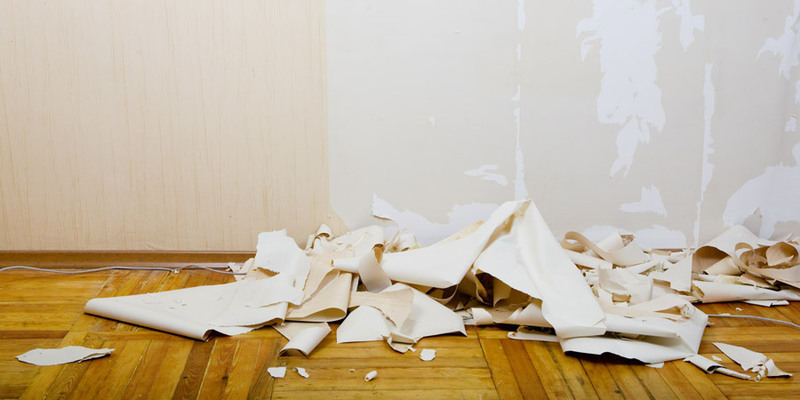 If you damaged plaster or drywall during wallpaper removal, it’s time to patch it up. 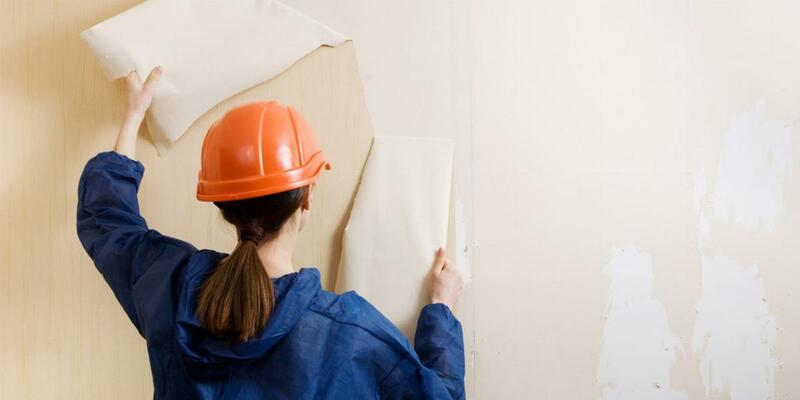 To fix drywall, you’ll need a spackling and patching compound. Spa recommends MH Ready Patch because it “dries fast, cures rock hard, and is shrink resistant.” Use a spackling plate to place the compound onto the areas with holes, then smooth out until flat. Now that you’re done taking down the old wallpaper, it’s time to paint! Whether you want to paint an accent wall or go with a vibrant color throughout the space, it’s important to select the right shade to set the mood. For more DIY inspiration, check out the For the Home section of our blog. Have you stripped wallpaper in your home? Let us know your tips and tricks in the comments below! 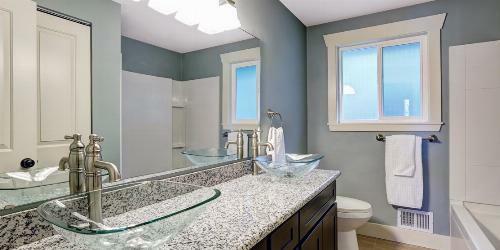 From replacing a faucet to installing new hardware, your bathroom remodel includes a variety of projects. Stay under budget with tips from Kohler, Signature Hardware, HomeZada and Niagara Conservation. 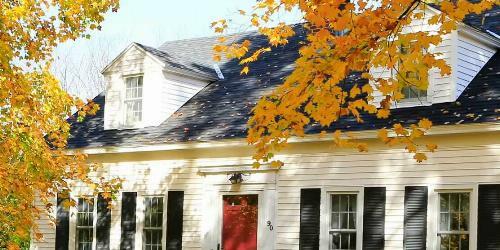 Complete these 10 projects before cold weather hits.